Disclaimer: This post contains a lot of bad advice. Don't do what this post says. And if you do, and something bad happens, it's not my fault. There's a lot of nonsense talked about food. Don't eat cheese for supper, do eat fish on a Friday, drink in moderation... we're always being told what to do, yet it is questionable how much of this guidance actually works. For example, let's take the commonly considered advice to "Eat five portions of fruit and veg a day". Have you ever actually tried to do this? FIVE portions? And they don't mean five portions as in five strawberries, or a potato sliced into five chunks, oh no, they mean five lumps of fruit slash vegetable. 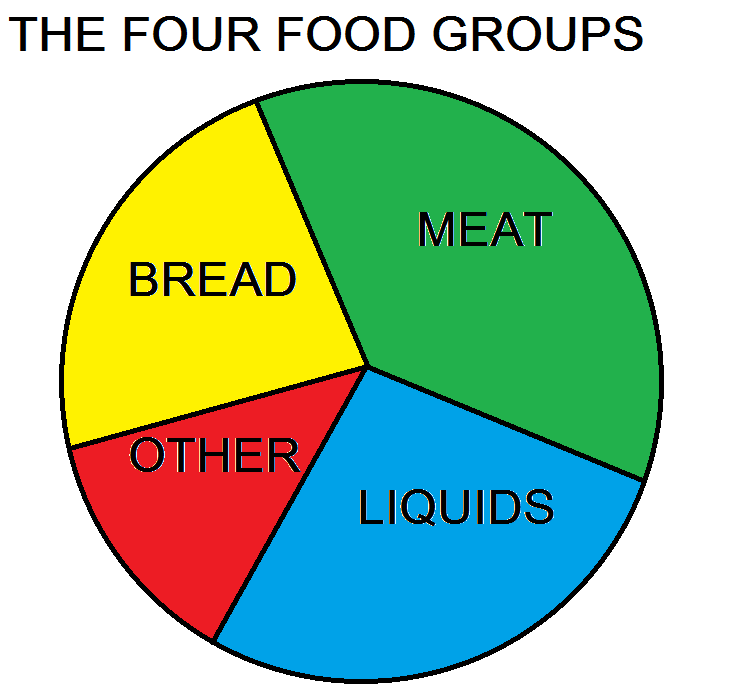 To clarify things, I am launching the definitive guide to the four food groups. Meat - this is obviously the most important of the food groups, being full of energy providing protein and fat. This is clear because it tastes the best, and our sense of taste is designed to "like" the things that give us nutrition. Trust me - I ate shower gel and it wasn't nice. Bread - bread, whilst not as important as meat, is still useful because you need something to hold the meat and to soak up liquids (more on this later). Try to imagine eating a pizza without the breaded element. Think how messy your hands would be. Not good, is it? Liquids - liquid is essential for your body to work, it's a bit like oil for your cells. Different liquids have different benefits, for example water is good for flushing your system out, gravy is like water but carries more nutritional benefits, and beer is a panacea for everything. Be aware that some foods that may not be considered liquid can fall into this category because they are based on a liquid, for example cheese and ice cream are both based on milk, therefore they are a liquid. Other - this is the most dangerous category, and is everything else that isn't in the three categories above. As you can see in the diagram above, meat has the largest segment of the pie (mmm pie). This signifies that it should form the majority of your diet. And "Other" forms the smallest segment, because basically if you are eating vegetables, basically it's just roughage, your body is getting no nutritional value from it, you are just putting your digestive system through a lot of strain for no benefit. Does that sound sensible? Furthermore, it must be understood that the human body adapts. Just as someone who runs a lot will probably be able to run quicker and further than someone who doesn't run a lot, someone who eats a lot of meat will gain more benefit from it. These I have defined as "levels". Level 1 - you are able to eat meat. Well done. Level 2 - your capacity for meat increases. Level 4 - you gain the ability to eat raw meat. Level 5 - you no longer expect the meat to be dead before you eat it. Level 6 - you are unable to walk past a field with a cow in it without jumping over the hedge, running up to the cow and chewing on a piece of it. Level 7 - you are essentially a lion. And who doesn't want to be a lion?!? I hope this introduction to nutrition is a useful guide for you. Next week I shall write about bread and how to incorporate steaks into desserts, also known as beefcake. Thanks for reading. I think you are forgetting two very important food groups, the beer group, and the coffee / tea (caffeinated drink) group. If you want people to take the science behind your conclusions seriously you will need to be more thorough, Mr. Raven. Please, take care of the oversight, resubmit your paper, and we will consider it for publication. That is a good point Adele, I'm disappointed in myself.